The new Vaya 600 ml Tyffyn is so cute that it will make your children grin with joy! You may have already read my review of the Vaya Tyffyn (1000 ml variant) which I’d written last year. While it was a pleasure to pack the food in the morning and send it with my daughter, it did prove to be larger than what she’s used to carrying. It actually reached me in early February, but thanks to moving to our new place as well as a bout of illness, I got around to using the Tyffyn only last week. The outer shell: This locks the inner boxes into place, much like the age-old tiffin carrier, with its clasps on the side. Two 300 ml boxes: They come with leak-proof rubber lids and fit snugly into the base provided. The boxes are made of stainless steel with a copper finish. Separators: The rubber separators are a touch of genius, honestly. They’re so easy to fit and remove , especially for kids, and allow you to pack up to four items in two boxes. *Bag Mat: This must be purchased separately. We used the one that was given with the 1000 ml Vaya Tyffyn and it worked great! The compact nature of the Tyffyn: I know I’m repeating myself but this is absolutely its USP. It’s light and can easily fit into a normal-sized lunch bag. Since we used the bag mat from Vaya, my daughter took her snack box too inside the bag and there was no problem. Fresh food: The food I prepared for Gy remained fresh and tasty, retaining the natural flavours and spices I’d added to the dish. Plastic boxes have the problem of leeching miniscule amounts of plastic into the food over time and this is one thing that positively worries me. The stainless steel boxes ensure that this can be prevented. 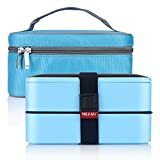 Leak-proof boxes: Every time I pack a gravy dish or something with curds or sambar, I’d almost invariably have a lunch bag to clean, wash and wipe dry when Gy returned from school. The Vaya is perfect in that sense. Zero leakage! This definitely gets two thumbs-up from us. Better lids with better grip: The 1000 ml model did have a bit of trouble with the grip holder being a tad tiny. Vaya has improved this by making the grip holes larger so kids can easily slide their fingers in and pry the boxes open. Minimal effort, especially in a rushed school canteen, is a relief. The Bag Mat: This snug carry bag is ideal for kids who have to juggle a school bag and a water bottle already. The compact cutlery pouch is comfortable to store a hanky as well as a pair of spoons. Retention of heat: I followed the instructions of pre-heating the containers with hot water, but the food did not stay piping hot. My daughter did confirm that it stayed warm at 12 pm, which was about 5 hours after I’d packed it. Overall, this is not too much of a concern for me personally, though, since Gy just loves the tyffyn and finishes the food. VERDICT: I’d highly recommend the Vaya 600 ml Tyffyn for your kids for two main reasons: the compact nature and the goodness of mom’s home-cooked food. Disclosure: I was asked sent the Vaya 600 ml Tyffyn in exchange for an honest review. This is a sponsored post but the views expressed are my own. You can read my complete disclosure agreement here. Interested to work with me? Check out the FAQs here. This post contains links to the Amazon affiliate program. If you click on the links and buy any item, I earn a commission at no extra cost to you. You can read my complete disclosure agreement here. I’ve seen other reviews and most have been favourable. I like the idea of the mat and more importantly the spill-proof boxes. That’s so important for kids. Indeed most wanted review for me at present. Thanks for sharing !!! This looks cute. As for food not staying piping hot, I don’t think most kids care for hot food. I know I certainly never did! I might give this a try when I get to adopt a kid. I’ll apply in May, if all goes according to plan. 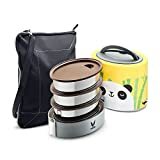 That looks like a cute and compact tiffin. I think it would work for office goers too! I like this variant too and enjoy using it! Just put up my review today! 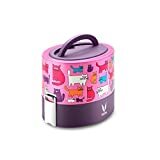 Vidya Sury recently posted…Vaya Tyffyn 600 ml premium #lunchbox #Review Enjoy homefood on the go! I thought I'd share 5 of the best books for tween girls, across different genres. These are all books my daughter personally loves and re-reads.